I've been giving #2 & #3 quite a workout. The only one I never seem to need is #1. What about you? What's your favorite bookish right? Ha ha. Totally. Who would NOT want to read?? Hi Lark, I agree my favorite rights are 5 & 10 as well. We should feel free to read whatever we want and not have to defend our tastes. I also have made peace over the years with not finishing a book. The one right I might take issue with is skipping pages. I figure for me best to put the book down if I have the desire to skip pages. Thanks for this important list. I do that too skip to the end. Five, six and seven are my favorites. It’s important for us readers to remember number one is ok. Sometimes I’m not in the mood to read and it’s ok. I’m getting better at putting books down that aren’t working for me. Numbers 2 and 3 are the hardest for me to "defend". I don't care if others do, but I have a hard time myself "giving up" on a book. 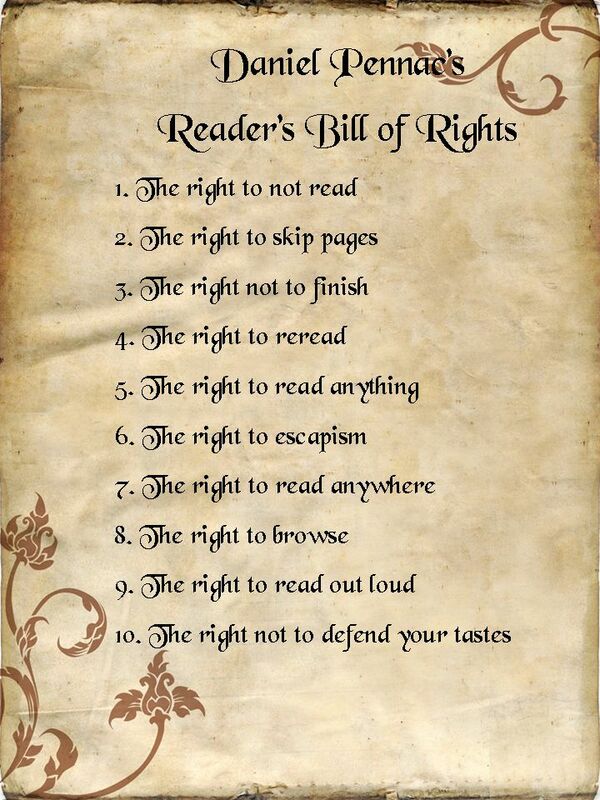 I would add to the list, the right to read the end first! I don't ever really do that, but I do sometimes jump ahead to see what happens when a book is particularly tense. The I go back and read up to that point. I'm totally on board with this bill of rights! :) I've just had to return a couple of books to the library that I didn't finish but moving on to new books now! I like this! I've always been the kind of person who would read absolutely anywhere, but I must confess I don't re-read very often. Then again, I guess that's the whole point--read what and how you want! I don't pass up on books too often (#1) and never skip ahead (I'm one of those readers who doesn't like to skip words, lol) but #3, 5, 6, and 10--- yes to all! In just the past year or two I've decided to not feel guilty about putting aside books I'm not having a good time with. Why should I feel guilty-- not everyone has the same taste in books, and while I don't like it, there'll be many others lined up to read it. I'm a people-pleaser, which also translates into an author/blogosphere pleaser, unfortunately unless I put my foot down. I love this. I just wrote a blog entry yesterday about how sometimes I like to read badly written books. It's like bad TV. It's so bad it's almost kind of good. I think it would such all the joy and fun out of reading if I read books with the thought of what other people will think (or judge) about them. I sometimes feel guilty when I could be reading, but am not doing so. I need to remember #1. It is okay not to read and still call myself a reader. Amen. No 3 is my mantra. Three and Ten for me! I hate people saying 'how can you read THAT' or 'how can you say you don't love THAT' Ugh. Go away! I justify myself to nobody!!! Love these! I have to say, #10 is great! I need to remember that one. I have no qualms not finishing a book. And I do love #4, because sometimes I want to curl up with a favorite...like visiting an old friend. Besides, #4 justifies keeping all the piles of books around my house, haha! These are all excellent--even #1. Sometimes, I feel the need to garden, putter, quilt, and lay the books aside for awhile. I definitely don't want reading to become work, hence skipping and stopping are part of the winnowing process. I agree! Reading should never be work. My favorites are #3 and #4, which might be kind of opposites, right? And also #10. In fact, this whole thing is wonderful! Love it! #3 & #4 are two of my favorite ways to read! :D Thanks for commenting. Celebrating the Year of the Dog!